Michael Phelps has already made an impression during the 2016 Rio Olympics. His death stare has been turned into a viral meme and he’s won three gold medals. Phelps, who came out of retirement to compete in Rio, has brought lots of attention to the sport of swimming, but his biggest contribution may be what his fame has done for other athletes. According to Chuck Wielgus, the executive director of USA Swimming, Phelps’ popularity and success in the pool has brought more money into the sport and his enormous corporate sponsorships have opened the doors for other swimmers. “We have a long list of athletes that have sponsorships today that can be attributed back to the success Michael has had and his corporate relationships,” Wielgus told CNNMoney. Phelps is highly marketable because of his success in the pool but also because of how relatable he is. “His strong relationship with his mother, which played out on TV, and his struggles with his father helped make him more relatable,” said Elizabeth Lindsey, a marketing expert at Wasserman. Lindsey noted that Phelps also benefited from the fact that he was the most dominant force in the sport at the time. As Phelps evolved as a marketable athlete, U.S. swimming as a whole benefited. Before Phelps, swimming didn’t have any live events on TV. Now, the major events are televised, which ups the profile of the sport and the athletes. It also makes both more marketable, which brings in more money. Through 2000, when Phelps made his first Olympic appearance, swimming trials aired on a tape delay. Although Phelps didn’t medal in Athens Wielgus said people within the sport could see what his potential was. By 2004, half of the Olympic trials were live and half were taped. Phelps won eight gold medals at both the 2004 Athens Olympics, and in 2008 all of the trials were aired live. That year, in Beijing, Phelps won another eight medals. He won six at the 2012 London games and this year the trials aired in prime time for eight nights. Attendance also sky-rocketed this year. For the first time ever, the trials were completely sold out. Wielgus said the evolution of the trials as a hot-ticket event has coincided with Phelps’ career and shows his impact on the sport. 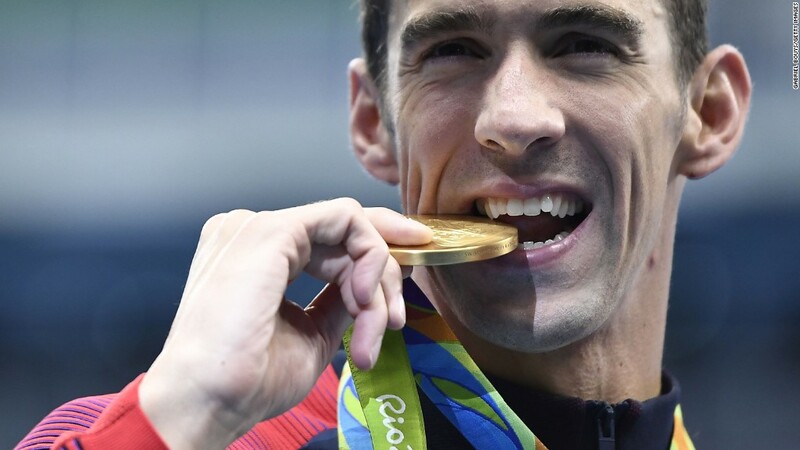 Phelps’ has a record-breaking medal collection. His total count thus far includes 21 gold, two silver and two bronze medals. Another effect of increased revenue for swimming is that it’s allowed pros to stay in the sport longer. Athletes can now swim into their late 20s and early 30s, according to Wielgus. USA Swimming is able to provide athletes on the national team with a $ 42,000 yearly stipend to cover living expenses and has developed programs to help swimmers compete internationally and win larger purses. Wielgus hopes Phelps will serve as an ambassador once he retires from the sport. “He will help us change our relationship with retiring athletes,” Wielgus said. Lindsey said Phelps has also impacted younger swimmers. “Phelps’ longer-term legacy is the other athletes who are swimming now,” she told CNNMoney, citing the throngs of young athletes who were inspired to take to the pool because of his success. According to USA Swimming, Phelps made swimming cool as a sport for boys. Prior to 2001, membership was 38% male and 62% female. Now, it’s 44% male and 56% female. Phelps has also started a foundation, which teaches water safety, introduces kids to the sport and provides financial assistance for swimmers.